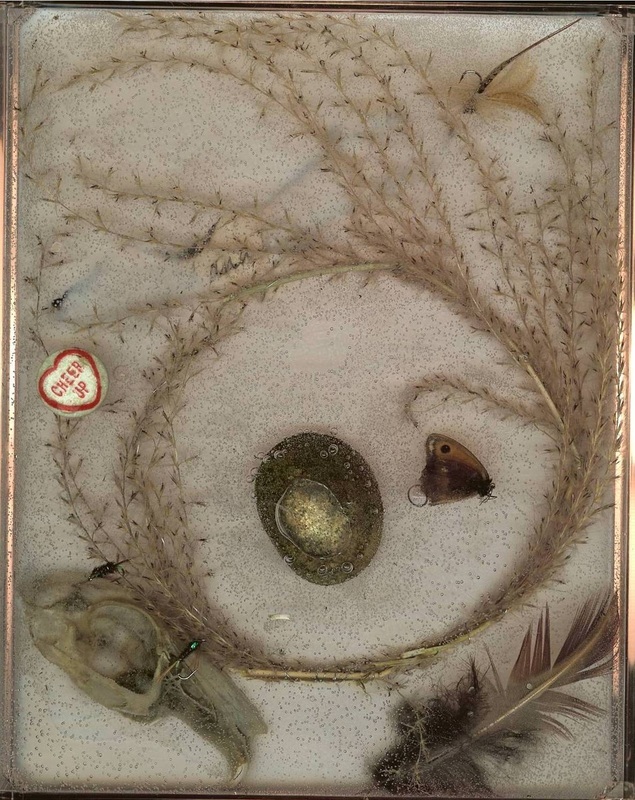 Wax vitrines by the artist and main character of Casting Shadows, Sally Kettlestone. A novel by Patricia Mullin. Embedded in the wax are objects from Sally's childhood collection; they act as clues to the unfolding mystery that lies at the heart of the narrative. 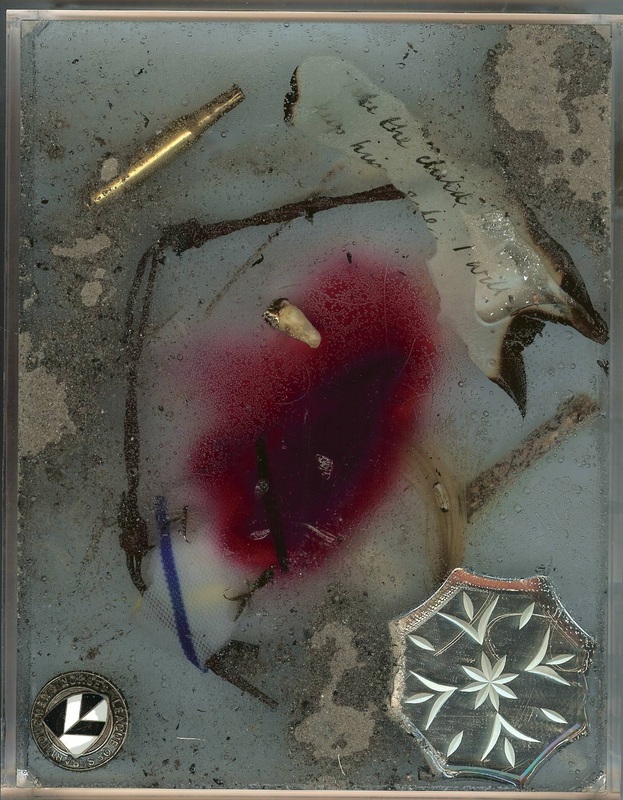 The fourth image is the reverse side of the third; here Sally's particularly macabre keepsakes project from the wax, inviting the viewer to touch or perhaps recoil. Click on the images to enlarge. I am interested in collections and display; the Pitt Rivers Museum in Oxford is one source of inspiration. I am intrigued by the personal made public; also the sense of reverence objects acquire when they are invested with sacred reliquary or museum-laden authority. It is no coincidence that my MA course, directed by the poet George Szirtes, was titled Writing the Visual. 2016 Sainsbury Centre for the Visual Arts - short story course - Fictional Narratives. Inspired by the Robert and Lisa Sainsbury collection. UEA Associate Tutor. 2009 Contemplating Julian. Site-specific creative writing course. The Julian Centre, Norwich course tutor. 2005/10 Readings and talks, Gene Genie Babylon Gallery Ely. Westminster Library. Cafe Writers Norwich. Pimlico Library. Book groups. Design/illustration/exhibitions/galleries - full CV available on request. After graduating from the Central St Martins, Patricia became a designer for Liberty & Co London working on the Tana Lawn and Veruna wool dress ranges, later freelancing and selling to international textile houses in the UK, New York and Japan. After teaching, quite by accident, she became an illustrator and her work has featured in Women's Journal; Taste Magazine; A' La Carte; Elle; City Limits; Time Out; Quadrant Design Associates; Vauxhall Motors and Landell Mills Commodities. Exhibitions and galleries include: The Artists Day Book, Smiths Gallery Covent Garden (Arts Council national tour). Women's Eye, Lauderdale House London; Snape Maltings Gallery/Suffolk; Blickling Hall Gallery,Norfolk; The Brandler Gallery,Essex; The Eastern Rooms,Rye; Opposite Ends - exhibitor and curator - Norwich; The Hostry, Norwich Cathedral. In addition, Patricia was a member of the Norwich Cathedral Exhibitions Committee, closely involved in developing the exhibition space within the Hostry 2009/10.